Tyres have always made an important contribution to road safety and to the environmental impact of road transport. However, not all tyres offer the same performance and it was hard for the consumer to know how to choose the most safe and efficient tyres. Luckily the EU tyre regulation that was introduced in 2012 enabled consumers to make more informed choices when buying tyres. The rationale behind introducing regulation was to improve road safety and to reduce the environmental impact of road transport. 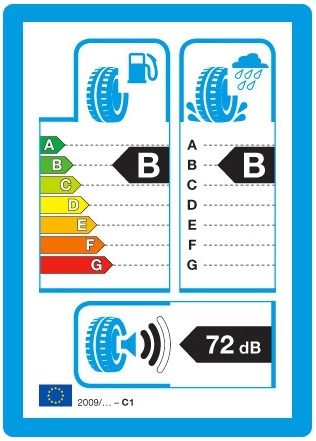 Tyres are now graded according to wet grip, fuel efficiency and external noise. The better the tyre (fuel savings, safety and external noise), the better the classification. Red G is the worst class; Green A is the best class. Fuel consumption is related to the rolling resistance. By reducing rolling resistance, the tyre consumes less petrol. 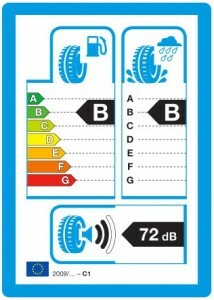 A range 7.5% loss of fuel economy between best and worst class for a full set of tyres fitted to an average car. 30% shorter braking distance between best and worst class for a full set of tyres fitted to an average car. Eg 18 m shorter when braking from 50 mph. All new tyres must come provided with this information – if you don’t get it then ask! What do you want to know about tyres we fit with our mobile tyre fitting service? If the tread is less that 1.6mm. If the tyre has any bald patches. If the internal construction of the tyres is visible. If the sidewall of the tyre bulges anywhere. If the tyre is split. If the tyre is not the same size as the one on other side of the axle. The speed rating is marked on the side of the tyre and indicates the maximum speed at which the tyre can carry the load corresponding with its load index. Example 91V. Even if you do not drive at these speeds, the correct specification is essential in order to comply with the vehicle manufactures recommendation and your insurance policy. RNF indicates that the tyre is reinforced. Reinforced tyres are mostly fitted on to small / light vans, people carriers and some 4X4 vehicles and estate cars. More recently, car manufactures such as Audi, Renault and Saab have been using a new type of reinforced tyre. These tyres are high-performance, low profile tyres and come as original equipment on high-performance cars. The extra load carrying capability gives these tyres more rigidity, enhancing the road holding. 6PR means 6 ply. These are tyres used on light commercial vehicles and are constructed using extra reinforcing called ‘ply.’ Most car tyres are 4ply construction. 8PR means 8 ply. These are tyres used on light commercial vehicles and are constructed using extra steel reinforcing called ‘ply.’ Most car tyres are 4ply construction. There are several different types of tyre that you can buy for your car. What you choose depends on how you use your car for, where you live, how you like the ride of your car and a variety of other factors. The different classifications are as follows, and some examples are shown in the image below. Performance tyres are designed for faster cars or for people who prefer to drive harder than the average consumer. They typically put performance and grip ahead of longevity by using a softer rubber compound. Tread block design is normally biased towards outright grip rather than the ability to pump water out of the way on a wet road. The extreme example of performance tyres are “slicks” used in motor racing, so-called because they have no tread at all. These tyres are what you’ll usually find on every production car that comes off the production line. They’re designed to be a compromise between grip, performance, longevity, noise and wet-weather safety so that they suit everyone’s style of driving. For increased tyre life, they are made with a harder rubber compound, which sacrifices outright grip and cornering performance. For the majority of you, this won’t be an issue. The tread design is normally a compromise between quiet running and water dispersion – the tyre should not be too noisy in normal use but should work fairly well in downpours and on wet roads (so great for our British summers!). The ONLY way you can accurately find your tyre size is to look on the sidewall of your tyre. Many tyre websites have software that looks up your tyre size from your vehicle registration or model. Unfortunately this is not always accurate. Sometimes you will get the correct size but when we tested it, it was often wrong. Check out our blog for information about how to read your tyre size and find out what all those numbers and letters actually mean? How quickly can you attend and replace my tyres if I book today? Most of our mobile tyre fitting bookings can be done the following day or any day onwards including Saturday mornings. Some areas are busier than others so next day is not always possible. It is very difficult to specify an exact time as we can encounter many things that may change the way we schedule the work up until the last minute. If you need to have the work done AM, PM, outside of school run times or lunch hours then there are various options available when booking online or if you prefer to book by phone just discuss your availability with us at the time of booking. Quite often we experience exceptional levels of work that may mean your requested date / time is not possible. We will do everything we can to reschedule a date / time that causes as little inconvenience as possible. We understand this is not always going to be acceptable. Once you’ve filled in our contact form we’ll be in touch to discuss the arrangements with you – and we’ll remain in touch throughout the whole process to make sure you become another of our wheely happy customers. All of our vans are equipped with state-of-the-art tyre changing machines, electronic tyre balancing machines and a compressor to inflate the tyres. All similar to the equipment you would expect to see in a traditional garage – but the garage comes to you instead! Yes we can. Our mobile service can fit tyres with a profile as low as 30. Our vans are also equipped with low entry jacks, which easily glide under the skirts of any sports car. We dispose of your old tyre, using carefully selected tyre disposal companies. The old tyres are sent to remould manufacturers or used in road construction, as fuel in power stations or even sometimes used for sea defences. At We Fix Alloys protection of the environment is a major concern and we dispose of your scrap tyres in the most ecologically friendly way possible. Each mobile tyre van is fitted with an electronic balancing machine, capable of balancing up to 20″ diameter wheels. Our mobile car tyre fitting vehicles are all equipped with Cemb electronic wheel balancers to ensure that when we replace your tyres we can also balance the wheel to make sure there is no vibration or shudder when the vehicle travels at increased speed. All our balancers are capable of balancing wheels including steel rims, alloy rims and centre less rims found on some Citroen, Renault and Peugeot cars. Where possible our tyre fitters will balance your alloy wheels without the balance weights being visible on the outside of the wheel. Most probably, yes. But there are British Standard guidelines that we have to adhere to. If the puncture is in the shoulder or side-wall of the tyre it cannot be repaired but if this is the case we will explain why and show you – don’t forget we can always order a new tyre for you and fit it with our mobile tyre fitting service. I have purchased my tyres already from another company. How much will you charge me to fit them ? We only fit tyres that we supply. That way we can be sure that our customers are getting genuine, quality tyres. I have expensive alloy wheels. Can you replace my tyres without damaging my alloy wheels ? That’s our promise to you! We use Boxer Pro (snap on) tyre machines in our mobile tyre fitting vehicles. The tyre fitting machine is a high quality piece of equipment and is capable of replacing tyres up to 20 inch including run flat tyres, 4×4 tyres and low profile tyres. What payment methods do you accept when you replace my tyres ? Our preferred method of payment when we replace your tyres is Debit Card or Credit Card. We accept all major Debit or Credit cards including Visa, Mastercard, Maestro and Solo. We will accept cash if you are unable to pay by Debit or Credit card but please note our fitters do not carry change. What guarantee do I get with my new tyres ? All of our work – mobile tyre fitting or alloy wheel repair comes with an electronic receipt sent direct to your email. This acts as your guarantee so keep it safe. Before we can arrange our mobile tyre fitting service we need to know the right tyres to bring to you! You might have noticed that we ask for a string of numbers and letters on our contact form. That’s so we can be sure that we are bringing the right tyre to you. Many companies try and get this information by asking for your registration plate but that’s not always accurate and as you know here at We Fix Alloys we like to make sure our customers get great service and that means getting it right! Now, that might be all you want to know but because we like our customers to be informed here is an explanation of what all those numbers and letter means. Height of the tyre sidewall as a percentage of the width. In this case 45% of 225mm. Also know as the aspect ratio. Latest News – We Fix Alloys, We Fit Tyres.. We make YOU wheely happy! Well it seems like Spring might not be on its way as soon as you’d like with all the weather changes recently but here at We Fix Alloys we have a great reason to have a spring in our step! Yes that’s right not only do we fix your alloys we can now fit your tyres too! We’re very happy to be working with Peter from Tyres2U (NE) LTD on this project as he has been working within the tyre industry for over two decades. We feel its a positive step forward to providing our customers the full wheel repair, refurbish and re-rubber package! We Fix Alloys, We Fit Tyres.. We make YOU wheely happy! – Call us today! !